There is a commercial frequently playing during Yankees games this season in which Aaron Boone jokes about not really doing anything during games other than pointing to the field and touching his face. The commercial is clearly made in jest, but I’m not so sure it’s far from the truth. I have joked in the past that since Brian Cashman is so good at trades and so bad at free agency, the Yankees should have Cashman conduct the trades and have a second general manager handle free agency, the way some NFL teams have a kicker for kickoffs and another for field goals. I think the Yankees need to follow this setup for their manager as well. Boone can be the clubhouse manager since he was hired for his personality and ability to communicate with the players. He can be the one who jokes in the room and keeps things loose with his impressions of the team’s roster. He can go out drinking with the guys after games, set up dinner plans on road trips and lead the card games on the team plane. Then, the Yankees can hire an actual game manager because after 174 major league games and another two months of spring training games, it’s clear Boone can’t handle in-game strategy and management. I thought things would be different for Boone in his second season. At times last year, it appeared as though Boone was new to baseball rather than soon someone who has spent his entire life not only in baseball but in Major League Baseball. The combination of oddly-constructed lineups, poorly-timed scheduled off days for regulars and disastrous bullpen management received anywhere from average to failing grades from the fan base, even though he received “A’s across the board” from Brian Cashman. But if you were the one who replaced Joe Girardi with an unknown at manager to lead a championship-caliber team, you would be hesitant to criticize your managerial selection as well. Boone’s shaky rookie season came to a head at the worst possible time: the postseason. His bullpen decisions in the final two games of the ALDS made those two games the final two games of the season as his moves were far from questionable and more irresponsible than anything. 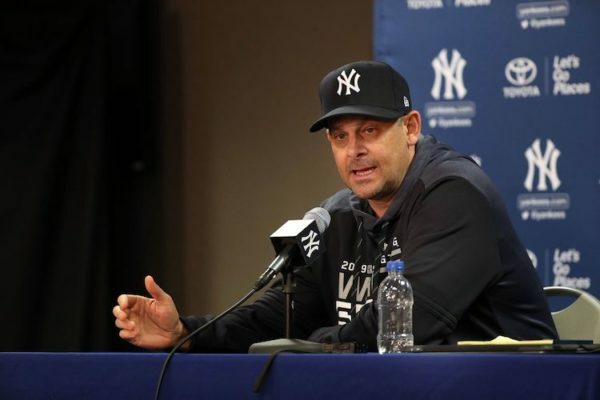 After initially defending his idiotic and egregious moves in the two losses with excuses which nearly made Girardi’s 2017 ALDS Game 2 non-challenge excuse look good, Boone returned for his end-of-the-season press conference and recognized he could have made better choices. It was the first time all year he acknowledged screwing up rather than citing one of his overused positivity phrases to summarize an embarrassing performance. That alone gave me promise his second year might be different. Unfortunately, 2019 has been a continuation of 2018 for the entire team, including Boone. The lineup is still using the home run-or-nothing approach with an inability to hit with runners in scoring position or even put the ball in play. After setting the Yankees record for strikeouts through the first five games of a season with 47, the offense stuck out a franchise-record 18 times in the sixth game. While injuries are a major part of the team’s mediocre start, Boone’s managing hasn’t helped matters. Boone isn’t the reason the Yankees are 3-4 this season and against the lowly Orioles and Tigers, two teams which will finish in last place in their respective divisions. He’s not failing to hit with runners in scoring position or striking out or throwing away balls or misplaying line drives in the outfield, and he’s not on the injured list. But it’s his job as a manager to put his players and the team in the best possible position to succeed and he hasn’t done that. The Yankees haven’t been routed and they have yet to lose one of the many games they will inevitably lose this season in which it just wasn’t their day. Rather, their four losses have all been close games and all very winnable games. That’s not to say if Boone made different decisions the Yankees would be 7-0 instead of 3-4, but it’s not outrageous to think they could be 4-3 or 5-2 if he manages a little differently and the moves pan out. Each of the four Yankees losses could have been wins. Not only because they were against crappy teams the Yankees are supposed to beat, but also because the Yankees were in all four of the games with a chance to come back, tie or take the lead. They didn’t, and Boone deserves some of the blame in three of them. This is the only one of the four losses in which Boone gets a pass. After loading the bases with walks in the first inning, Miguel Andujar decided he would swing away at a 1-0 pitch and grounded into an inning-ending double play. From there, the Yankees never really had a chance. Boone brought in Chad Green and Jonathan Holder and they allowed a tie game to become a loss. This game could be chalked up as missed opportunities and the exact type of performance the 2018 Yankees gave us too many times. On Sunday, J.A Happ put the Yankees in a 4-0 hole early in a start which was eerily similar to his ALDS Game 1 start. But the Yankees fought back and by the seventh inning, they were trailing 5-3. Boone had Zack Britton up in the bullpen with a two-run deficit, but never brought in the lefty. When the Yankees got within a run at 5-4, he still didn’t bring in Britton. Instead, he brought in Stephen Tarpley, who immediately served up a three-run home run to destroy the Yankees’ chances at completing the comeback. Why was Britton warming up with a two-run deficit, only to not come in once it became a one-run game? Did Boone think his offense couldn’t score one run over the course of two innings against the vaunted Orioles bullpen if the bullpen were able to hold the deficit at one run? To make matters worse, in the ninth, the Orioles loaded the bases with no outs against Tommy Kahnle, and Boone got Chad Green up in the bullpen. Green, apparently, is able to warm up and come in for mop-up duty in the ninth inning of a four-run game, but is unable to come into a one-run game? This is the type of bullpen management Boone nonsensically used in 2018 and the type of bullpen management which helped eliminate the Yankees in four games in the ALDS. Boone decided being down 119 home runs from 2018 in his lineup wasn’t enough, so he had Gary Sanchez and Troy Tulowitzki on the bench as well. He picked Tuesday to give Tauchman the start in left field and have Frazier, Wade and Romine all make their season debuts, creating a formidable 6 through 9 in the order. With this lineup, the Yankees scored one run over nine innings and lost 3-1. The icing on the cake came in the ninth when Boone allowed the bottom of the order to bat, electing not to use his bench, which included Gary Sanchez and Troy Tulowitzki. On Wednesday, the Yankees’ once again managed to score a single run in the game. That run was a product of DJ LeMahieu, who should be leading off every game until Aaron Hicks is back, getting on base and being driven in by Aaron Judge. (It’s amazing how when the leadoff man is actually on base, the Yankees are able to score runs.) LeMahieu was only leading off because Brett Gardner, who will apparently be the Yankees’ leadoff hitter in the absence of Hicks no matter what, had a scheduled day off. Trailing by a run in the eighth, Luke Voit reached base to lead off the inning. Immediately, David Cone said Gardner should be in the game to run for Voit, but Boone stayed with Voit, and then after an out was made, Voit remained on first. It wasn’t until two outs were made that Boone decided to use Gardner a pinch runner. And then with two outs, Boone had Gardner attempt to steal second and he was thrown out to end the inning. Why wasn’t Gardner jogging onto the field to run for Voit the second Voit’s foot touched first base? At that point, Gardner’s presence on first alone might have led to a mistake pitch for extra bases in which Gardner would have scored. Or maybe his presence creates a wild pitch and he moves into scoring position. Or maybe he can attempt to steal second when the Tigers aren’t sure when he will run. The possibilities were endless with no outs, but with two outs the Tigers knew Gardner was in the game to steal, and they had no trouble throwing him out. When Gardner didn’t come into the game, I thought maybe Boone was in the bathroom taking a dump or in the tunnel being told by the analytics team exactly what to do. But when Cone mentioned bringing Gardner in to run, the YES cameras showed Boone in the dugout, so the only explanation is he didn’t think to do it. Needing Voit if the game were to go into extra innings isn’t a valid reason since you have to actually get to extra innings before you can manage for them. Boone simply froze with the leadoff man and an opportunity to create offense to tie the game. Maybe the Yankees are 3-4 even if Boone changes the way he managed in the four losses, but there’s a good chance their record is better. I didn’t think Boone could be worse in 2019 than he was in 2018, and it’s possible he isn’t, but he’s certainly not any better. The Yankees, these Yankees, in the middle of a championship window need their manager to be better. Boone has to be better.